We were headed home after a brief excursion into the Sierra Nevada foothills, and as we enjoyed the colorful sunset we noticed a solar pillar (or sun pillar). The pillar is caused by light reflecting off of ice crystals in the upper troposphere (the part of the atmosphere that we live in and where most weather occurs). It's maybe not the most vivid ever seen, but they always catch my attention. Now, if we could just get the auroras down south into California tonight! That's amazing! I've never seen a sun pillar before, but it sort of reminds me of the sundogs I've seen here in the Yukon and back home in Manitoba in the winter. Thanks for the awesome blog posts, btw. I've enjoyed every one of them! That picture is pretty incredible! If you wanted to do some exploration (digging around) what kind of minerals would you find? 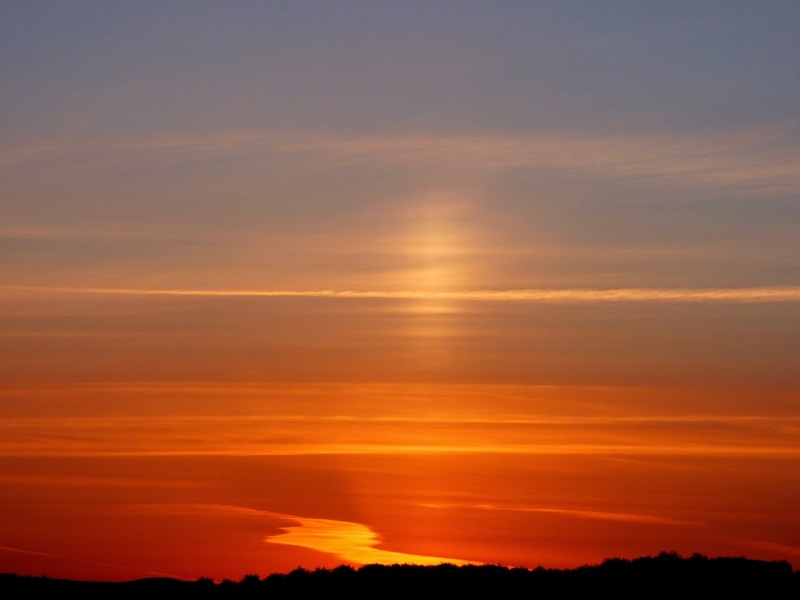 The photograph captured the sunset and solar pillar remarkably well. I found this natural phenomenon very interesting and came across a website www.atoptics.co.uk that is dedicated to several visual spectacles produced by the light playing on water drops, dust and ice crystals in the troposphere.